Amidst the blizzard of advertising I receive each week for Verizon FIOS, I have also been receiving ads from Pepco for their Energy Wise Rewards program. If you live in Montgomery County, Maryland, you've probably been getting these letters, too. Part of Pepco's offer is for a free internet-capable thermostat. Yes, free. Free installation and free service, too. Gosh, it's hard to ignore free service. I'm used to anything to do with my heat pump either requiring a $100 minimum service call or me spending oodles of time staring at my current programmable thermostat which tells me everything but why the heating system isn't doing what the thermostat says it is. Why would Pepco make this offer? Remember that Pepco sold off their generation facilities so now they have to buy electricity. My bet is that Pepco has a sliding scale determining how much they pay for energy. Anything over a certain amount costs Pepco significantly more than it is able to charge its customers (who buy electricity at a fixed rate). So Pepco wants to sell us lots of energy but not too much. How does Pepco plan to get customers to consume less? Rather than using rebates to encourage voluntary conservation as other jurisdictions are doing, Pepco is offering to be a bit more heavy-handed with rebates. The thermostats Pepco provide have a remote cutoff so Pepco can turn off customer AC or heat pumps remotely during periods of high energy use. This is fine for people who don't work at home during the middle of the day - exactly when Pepco is likely to cut the AC. Pepco assured me that it happens very rarely and there are ways to override the cutoff in the rare event that it is necessary. It all sounded good to me. Long-time Washingtonians may recall Pepco's Kilowatchers program. Pepco installed radio-controlled cutoffs on major electrical appliances in the home. For reasons unknown to me, Pepco suspended Kilowatchers many years ago. But the essence is reborn in the Energy Wise program. And if you don't want Pepco messing with your thermostat, Pepco will happily put an old-style dumb cutoff on your AC or heat pump. You don't even have to be home. Pepco says that reason alone explains why most people are opting for the dumb cutoff over the internet thermostat. But I liked the idea of the internet thermostat. Pepco promised better energy statistics, better usability (imagine having the house at the right temp upon getting back from vacation and yet saving money at the same time), and more. The best part was the idea of sitting at my desk and being able to see a week's worth of thermostat settings at a glance. That sounds so much better than what I have to do now - manually push buttons to see 4 settings x 7 days x 2 seasons! Besides the 56 different periods, each period can then require many button presses to adjust the temp and time. So we're talking a couple hundred button clicks! Ack! Admittedly, my thermostat lets me copy days that have a common schedule - but my family's schedule is different almost every day of the week so I cannot use that feature very much. By comparison, Pepco representatives repeatedly told me that the web interface would show a simple list that would be simple. Simple. Simple. Simple. How hard could it be to screw this up? Even a simple spreadsheet would be easier than all those damn button clicks required by a physical thermostat. So after contemplating this for awhile (and throwing away many months worth of Pepco mailings), I finally made the call. Sign me up! I accepted an appointment for Tuesday morning. I was told that I could have a window from 8am-11am. You can probably guess where this is going. I took the whole morning off from work. At 10:30am, I started to worry and called Pepco. The representative assured me that the technician merely needed to arrive inside the window and could complete the work outside the window. I sure wasn't told anything like that when I originally set up the appointment. Sure enough, the technician and showed up at 11:00am. Grrr. The technician brought along a trainee to watch and assist. So I asked if I could watch too. No problem, I was told. First, the technician installed a wireless networking device on my router. To control the thermostat, Pepco uses a home-area network system called Zigbee. The Zigbee controller is an Ethernet device that is supposed to plug in to the homeowner's router. And although I have a router, it didn't have a spare port. Why didn't Pepco tell me about this in advance? I had assumed the thermostat would be a WiFi device. Alas no. So I temporarily unplugged something else from my router in order to plug in the Zigbee and get the thermostat working. My advice to others: Customers without spare ports should ask Pepco in advance whether they need to buy an Ethernet hub or Pepco will provide one. I have two heat pumps with separate thermostats so the technician replaced my thermostats with two new ones. I was a little annoyed that he clipped off the wires rather than unscrewed them. There's not a lot of slack left in my thermostat cables. It would only have taken another minute to unscrew them. But I had already pointed out that he was using the wrong kind of screwdriver to remove the old thermostat from the wall. Nor did he have a wire stripper. Why don't these guys come with the right tools? The hell with professionalism. I could not believe this guy was training people. In the interest of expediency, I kept my mouth shut. When he was done, I asked him to show me Pepco's website to control the thermostats. "We leave homeowners to do that on their own." He made reference to people not being comfortable with Pepco personnel knowing their password. That made no sense - after all, it's Pepco's system. Pepco has complete control over it. It hardly matters that whether Pepco personnel know my password or not - Pepco can still control my thermostat. I pressed him on this and finally he said he just didn't have the time - he had other appointments. Since he showed up late for mine, I could hardly argue with him over that point. Although both thermostats were turned off, I let him go. I surfed over to the url he had given me to register an account at pepco.com/rewards. Forgive me if I drag you through the details but I must. They deserve a thorough airing if only to show website designers what to avoid. The website starting by asking me for 3 pieces of personal information. Let's call it pseudo-information because it was all from my monthly statement. How stupid - if you open someone's mailbox and take their bill, you have all the personal information needed to masquerade as them! If you're going to get all the information from a bill, it doesn't matter whether you ask for 3 pieces of information or 100. Next, Pepco required completion of a captcha (distorted bits of text you are required to type in). Captcha's don't identify people - they merely prove it's not a robot filling out the form. But that's pointless given that the form just asked for information that could only have come from one person's statement. Whoever decided on their security measures didn't know the basics. Or was overridden by bad corporate policy. The next web page asked for really personal information just in case I forgot my password in the future. No doubt you've encountered this before. I was presented with a choice of things like mother's maiden name, name of first pet, and so on. This design is a disaster. By insisting on information that only you know, it immediately becomes information that not only you know. Because now Pepco knows it. And since these same questions are used for password recovery by many financial institutions, access to your money and identity has been granted yet another way to be compromised. Sadly, I have found that people really do see my personal information. My most convincing encounter with this reality came when I was telecommuting one day and found that my password wasn't working. I phoned the computer support staff at my own place of employment and they proceeded to ask me my personal questions, listen to my answers, and confirm the answers matched those on file. In other words, other people were seeing things that only I should know. Fortunately, I had planned ahead and read back the answers I had given years earlier. The name of my elementary school: a. My first pet's name: ab. My favorite sport: abc. And so on. Sorry for that digression but I've never read a thorough explanation of all the problems with this type of password recovery system so I thought I'd put it down for the record. I resisted sharing it with the Pepco representative even though, by this time, I had already phoned Pepco for help. In fact, I called earlier, having failed at the first step - getting the pseudo-personal info from my statement. Evidently, my statement didn't square with their view of it. The representative was happy to stay on the line as I completed the remainder of the page, the next page, and so on. Finally, I got to the fifth and last page. Whew! But instead of a welcome screen, I got: The system is unable to process your request at this time. Please contact a Pepco representative if you continue to have trouble. Since I was already on the phone with just such a representative, contacting one was a snap. (The first thing that went easily that day.) She couldn't explained what had gone wrong but decided it was because I was using the wrong browser. ("We don't support Safari or Chrome.") I doubted that was an issue because the pages were just simple forms and, after all, I had successfully completed four of them. The diagnostic smelled to me like an issue on their end. However, a quick look at the source showed me that their service was Microsoft-based so, yes, compatibility could be an issue. She told me to use Internet Explorer. I told her "I'm on a Mac; there is no IE for MacOS." She then assured me that Firefox was supported. So I went through their signup pages again. Again: There is a problem with the system. Please contact a Pepco representative for assistance. At this point, the Pepco representative did something on her end and I was able to log in. Only to be showered with new forms. The system wanted me to fill out a detailed questionnaire regarding my house - size, construction, windows, etc. After getting out of this rat's nest, the representative told me how to get to the page to pay your bill and set up Auto Bill Pay. Me: But I don't want to pay my bill or set up Auto Bill Pay! Pepco 1: You don't? Isn't that why you called? Me: I called so I could get access to my Pepco-provided internet thermostat. Pepco 1: Oh, you want a different number. Me: Are you sure? I dialed the number I was given and got to you. Pepco 1: Yes, I'm sure. Me: Ok, what's the number. Me: That's the number I dialed to get you. Please transfer me - don't make me call a number that will bring me right back to you. Pepco 1: Uh, hold on. Pepco 2: What can I do for you, sir? Me: I'd like to know how to access my Pepco-provided internet thermostat. Pepco 2: I'd be happy to redirect you to a person who can take your request to have a thermostat installed. It took a while but finally I convinced her that I already had the thermostat installed and just needed the url to the page to control it. She then broke the bad news. "That feature is not available yet." I'll skip the lengthy discussion that ensued. Suffice to say, after I was certain that she had to be confused or misinformed, I spoke to her supervisor, Dave Boyer, who explained that the functionality was still being tested by Pepco employees who had the thermostat in their homes. What? How could this be? Wasn't it tested before being advertised? And hadn't it been advertised for months? (I have an email pointing out that it was advertised to be available in the summer of 2009!) The supervisor had no good explanation. He didn't understand why I was unhappy, so I explained about the hundreds of button pushes that would be required to program the new thermostat. (Wait, multiply by two because I have two of them!) And I would have to learn how to use the thermostat - a thermostat with a tiny screen and just a few buttons, each overloaded with lots of modes and functions. Ugh. All in all, an experience I really didn't want. And certainly not the one I had been promised. The supervisor offered to send out a technician to uninstall the new thermostats and reinstall the old ones - no charge. I thanked him for the offer while pointing out that based on my past experience, it would require me to sacrifice another half day off from work to do the reinstall and possibly another half day to re-reinstall the new one. He said that the technician could call me at work so that I could leave in time to meet him at my house - and that this courtesy was always available. But why wasn't I told this before? I also expressed my displeasure over a number of other things - such as the way the program was advertised. Had I known Pepco was not ready, I would have waited. Pepco shouldn't have advertised at all. At the very least, Pepco should have explained the true state of the customer experience. Before signing up originally, I spoke to a Pepco rep who very clearly extolled how easy it was to use the system. How could this be if it wasn't even available? I asked the supervisor whether he had one of the Pepco thermostats. Answer: No. "Not available in my area." I told the supervisor that I now faced a decision. Should I make another appointment for a Pepco technician to come reinstall my old thermostat? Or should I wait for Pepco to finish their testing betting that the outdoor temp wouldn't get too cold or too hot in the meantime. I asked the supervisor when the web interface would be available. He thought sometime in June. I asked him to find the person who knew for sure - surely someone must be in charge there - and get a real answer. After placing me on hold for awhile, the supervisor came back on the phone and admitted that he couldn't get hold of the project manager but that the manager was due to show up in two days and he would get me a clear answer then. (What? No one can get a hold of the project manager for two days?) That was five days ago. I have not received any word from anyone at Pepco since. At this point, I've filed a complaint with the Maryland Public Service Commission which regulates Pepco. Needless to say, Pepco needs to do more than just testing. It needs to fix: its web interfaces, its privacy and security practices, its installation practices, its advertising, and finally, how it communicates with customers. If customers are so badly misled, Pepco shouldn't expect customers to sign up for its programs, no matter how good they turn out be. Indeed, I related this story to several people and each one had a Pepco tale of woe. One of my friends said that he filed a complaint with the MD PSC last year about the same program. It seems that Pepco had advertised the program would be available last summer and it wasn't available. I've also found Pepco's blog which has lots of people complaining about the web billing system. I am experienced enough to avoid Auto Bill Pay systems but how naive was I to have signed up for the internet thermostat? Several of the people I spoke to asked why I would trust Pepco to have control over my thermostat. Now I'm wondering what could I have been thinking when I agreed to this. More importantly, my house is cold. Thanks for posting this story. I was going to sign up for this program. Now I know that I should wait. How can they advertise this program when it is not ready?? My old electronic thermostat was acting up. The cheapest internet accessible replacement I could find was around $350. I jumped when I got the Pepco offer. I asked how it "phoned home" and was told they dropped a wire down the wall that acted as an antenna. My installers(1 in training) showed up early & used the same method you describe to connect. The thermostat needs constant power so Pepco put in a box in my air handler to simulate this on my 4 wire system. I removed my old unit before they arrived. Pepco needs to verify everything is working. They allowed me hold the wires together for this test. Pepco uses a custom White Rodgers thermostat. Looks like a nice unit with many user and tech options, but, is not user friendly. They only leave a 2 page instruction sheet. I wasn't able to find better instructions on Pepco's site or this model on the net. One option allows auto cut-over for heat & cooling. The first cool night my heat came on. I noticed the fan started & stopped @ full speed when the unit called for heat. About 30 seconds later the fan came on again at heat speed(from the furnace temp sensor). I discovered the unit has a telnet client but needs a username & password. I called Pepco Rewards. Very nice but not yet knowledgeable. Spoke with several people. No promised date on the web interface. No one knew about telnet or the login info. No additional printed or electronic instructions. They couldn't walk me through fixing the fan and insisted on sending a tech. Turned out to be a switch behind the unit face. The thermostat appears to be multi stage, has an AC delay before restart and many service options. We should find these options and post them so we can avoid these additional Pepco service calls and take advantage of all features. PEPCO provides two versions of the thermostat, the PRO-V and the PRO-Z. The PRO-V is described on the datasheet (above) as the VHF version and the PRO-Z is described as the ZigBee version. If you want full remote control of the thermostat from a web browser, you'll need an internet connection at you home (such as DSL, FIOS, or Cable Modem) and you'll need the PRO-Z version of the thermostat. The ZigBee device plugs into your router and provides a wireless link from your router to the thermostat. If you were an early customer, then you probably have the PRO-V version of the thermostat. PEPCO will swap out the PRO-V and replace it with a PRO-Z at no charge, and will provide a ZigBee device, which requires one router (or Ethernet switch) port. The thermostat installers tend to NOT correctly configure the thermostat, in my experience. Check the little switch in the thermostat and be sure that they set it to the type of system that you have. It has two settings: Electric and Gas. Use Electric for a heat pump and use Gas for a Gas system. There are also a bunch of programming settings that should be verified, in addition to setting the time and temperature settings. Any idea ow what the username and password are for either http or telnet? I don't know the password, but I do know that it's not the default password that is published in the documentation for the ZigBee device. Also, I asked the installer if the password can be given to the customer, and he told me that PEPCO does not give out the password. The thermostat instructions are very poorly written and outright wrong in places but I did eventually figure out how to program it. There are no instructions on how to set the clock;just a statement that it is automatically update every 24 hours by the system. I've had it installed 2 weeks now and the clock is still wrong. What good is a programmable thermostat with the wrong time. I suspect that the communications are not working. My electricity generation is from BGE and my transmission service is from PEPCO. Why would PEPCO sign me up and administer the program instead of BGE? Any energy savings would accrue to BGE not PEPCO. PEPCO sent me the offer in the mail and when I called I asked if I qualified for the program and they said I did. Time is the first option after pressing the "program" key. Next press "select" button and set the time and date. I was able to figure out nearly all the settings except when it showed TZ and 5. Maybe that means time zone? Anyway I don't know whether 5 is the correct setting for TZ but I left it there. It is a shame that Pepco could not include those instructions on the instruction sheet. Trying to save on ink? Anyway, since my time never did auto set I fear that I don't have a working communications link with Pepco or does everyone have to set the time manually in spite of the instructions saying it will be done automatically? The time gets set automatically on my thermostat, including the change from EST to DST. My guess is that your thermostat is not receiving the radio signal from PEPCO that sets the time. On a side issue, did PEPCO install the ZigBee device, too? It's a little black box that connects to your router. Thanks Louis for that answer. Yes there is a Zigbee box hooked into my router. I can see it on my network but I can't access it because I was not given the password and the default name and password from the documentation on the manufacturer's website did not work. I am puzzled as to how Pepco communicates by radio signal since I could not find any radio link capability other than Zigbee in the device manual and I thought Zigbee was just a short range home network link. Doesn't Pepco use the internet link to communicate with the Zigbee box which then links to the thermostat? My Zigbee box is a Digi Connectport X2. The installer said he failed to communicate with the Zigbee box from his car parked in front of my house using his laptop. He then came inside and tried it standing near the box. Since he said nothing further I assumed it must have worked but now I wonder. PEPCO communicates with the thermostat via a unidirectional VHF radio link. The antenna is a short length of wire that hangs inside the wall behind the thermostat. To see the antenna, you have to dismount the thermostat from the wall. When the thermostat is dismounted, you'll see 4 or 5 wires that connect to your furnace (or heat pump indoor unit) along with a short wire (about 5 inches long) that is the antenna. As far as I know, the ZigBee device is used only to provide a short-range radio link between your router and the thermostat. I'm not certain, but I think that the internet link is used only for the web access feature, which currently is not functional. As a further clarification, the VHF radio link that PEPCO ses to control the thermostat does not rely on the internet at all. The PEPCO-to-thermostat link is a high power radio signal in the 139 MHz to 174 MHz range, whereas the ZigBee signal is a low power signal in the 2.4Ghz range. "ses" should be "uses" in the previous post. That was a typo. GREAT article. I've just started wrestling with my thermostat, having had it installed since mid April. The thing can be unreliable, I set it to 77. The room temp is 77. It proceeds to call for cooling for 1-2 more hours. This is at night, not during the hot day. Another digital thermometer shows the room has gotten down to 75 degrees. Then I set my extra thermo right on top the Pepco White Rodgers thermostat. The temp starts creeping up. I believe that the thermostat is actually making heat, inside it, somewhere. And no, there is no gaping hole where the wire comes through that pours out heat - it is sealed. I called their phone number. The lady on the phone obviously didnt understand my issue at first. They scheduled a repair order. So I'll try a new unit. Between this and the lack of the web interface, this t-stat is a POS. The oversold the interface to the public before it was ready. I'm sure that never happened before. How, exactly, will PEPCO know when I just pull it off the wall and put up the old programmable one that I still have?! There's a good use of my decade-old electrical engineering degree. They can send their stupid VHF radio signal to it while it is sitting in a drawer. Andrew, it sounds like you have a defective thermostat. I have the PEPCO thermostat, and when my room temperature reaches the "set" temperature, my A/C stops running. No question, though, that the remote access feature was sold to the public before it was ready. Agreed, that's why I'll give them a chance to fix it. We all know that most digital t-stats don't show their decimal point, but must know what the value is. Often a system will run even with the temperature "at" the setpoint, for short periods of time. But there's no excuse for being 2 degrees off and jumping around. Let me put on my tinfoil hat: PEPCO ordered it to run long at night, cause they wanted to sell me power that they pay less for, but can charge me a flat rate for. Ooooh that gives me an idea. Disconnect their "antenna" and see if performance improves. If it does not improve, I can put away my foil hat. Thanks for filing the complaint and posting the response from PEPCO! I've had this thermostat for almost a year and have been patiently waiting for the internet interface to become available. I hope someone finds the default password, I'd love to see what information the thermostat is holding. Just received an automated call from PEPCO advising that "the batteries in the Energywise Rewards thermostat may cause the unit to fail" and to "remove the batteries immediately." Very strange. I wonder what's up. Here are the instructions from the manual on changing the batteries. You need to hold onto just the front part on the sides and pull VERY hard. The cover will come flying off along with the elastomer buttons scattering on the floor. Remove the batteries and replace the buttons on the cover and press it back on. Everything looked OK with the batteries to me. I don't know what it is all about. where the time is normally displayed. Gently pull the cover straight off the base. end to the left (see diagram on page 12). (COOL, HEAT, or AUTO) is displayed. If I understood the message from PEPCO correctly, it said to just remove the batteries. It didn't say that the batteries were defective and it didn't say that the batteries should be replaced with other batteries. It sounded more like the problem is that having batteries in the thermostat will cause a problem. The exact nature of the problem that would be caused was not stated, though. As of this moment, there is nothing on the PEPCO web site about this problem. What I'm really wondering is why PEPCO made a mass call to warn people about something as seemingly trivial as a possible thermostat malfunction. There is no risk of frozen pipes at this time of year due to lack of heat caused by a thermostat failure, so why such urgency? I'm wondering if having the batteries in the thermostat might expose some safety issue. There was a recall of the same brand of thermostat with a similar embedded Comverge module back in June 2010. Here's the real reason for the call from PEPCO. Several of the thermostats have experienced overheating problems that lead to an internal meltdown (smoke, etc). 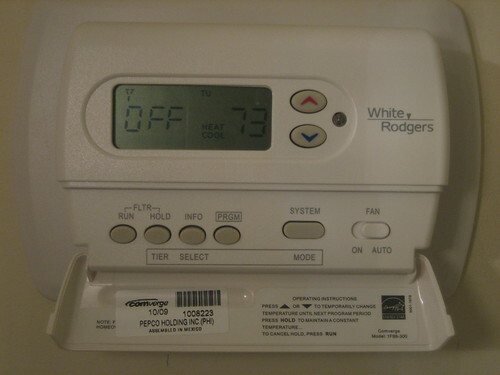 White-Rogers and the Comverge (the thermostat manufacturer and the communication module manufacturer) are claiming that the battery leakage is the cause of the problem. White-Rogers has submitted a proposal for "corrective action" to the Consumer Product Safety Commission. White-Rogers and Comverge are waiting for the "corrective action" to be approved by the CPSC. Following approval of the modification, PEPCO will visit homes and modify or replace the thermostats that have been installed. In the meantime, to avoid the risk of fire, customers are being told to remove the batteries. Yes, it works one-way. Now waiting for a reply from the PSC as to when it will be interactive. You need the Pro-Z thermostat and the ZigBee unit to get interactive support, but PEPCO needs to finish their implementation, too. I have the thermostat installed, but I was not given a ZigBee unit. Does that mean I can't program over the internet? The installers never told me I needed anything additional. Also, Tuesday night my power went out. I saw that my termostat was recieving communications from Pepco, but the time is off by 12 hours (says 5pm when it is 5am). Very annoying. With the non-ZigBee version of the thermostat, you can program it over the internet, but you can't query the thermostat over the internet. The ZigBee version allows you to query the thermostat over the internet (e.g. find the current temperature of your house, etc.) However, PEPCO has not implemented the query support on their website, so at present, the ZigBee and non-ZigBee versions of the thermostat provide the same capability for PEPCO customers. For customers of more progressive power suppliers, the ZigBee version of the thermostat provides significant additional remote access capability. So the ZigBee contribution to energy management is ... consuming electricity 24/7 all year long. Well done Pepco. Send me another. Part of the ZigBee spec is a requirement for extremely low power consumption. The energy savings that is anticipated far outweighs the additional energy consumption by ZigBee devices. We have the non zigbee version and can program the settings from the web but they don't get transmitted to the thermostat. I caller Pepco who said they would send someone to replace the faulty device although I am not convinced that the device rather than some configuration at Pepco is the problem. That was last week. They were supposed to call the next day. Needless to say I am still waiting. The Furnace Filters business prevent the air borne particles from disrupting the functions of air conditioners by preventing the clogging of heating or cooling fins. Plumbing parts retailers will often have a much better selection of pumps and be able to provide specialized knowledge for their installation. I have one of my Plumber London business It gives good job for plumbing work. Microdermabrasion reduces or eliminates facial lines, wrinkles, and signs of aging. It improves the appearance of acne scars and it gives skin of all colors and types a fresh, healthy-looking glow. Our Heating and Air Conditioning Baltimore business, it will help you select the best air conditioner for your budget. Bigger is not always better. It will analyze your home to ensure that the right size air conditioner is selected for optimum cooling and comfort.Acumen Heating has wide range of experience with many different brands of air conditioners including American Standard. Analyze and Trade Cross-instruments even Options Trading for beginners can do, refers to Options Trading in two markets with high coloration. Let's say the symbol SPY stands for an ETF of S&P500 index, and symbol RUT stands for an ETF Russell2000, and are correlated indexes. Our Hard Start capacitor provides that extra power of energy. Capacitor is very easy to install and will remain permanently in the equipment. Air conditioning technologies continues, with much recent emphasis placed on energy efficiency, and on improving indoor air quality. Reducing climate change impact is an important area of innovation, because in addition to greenhouse gas emissions associated with energy use. Air Conditioning Service North Houston business is one of them. I have got very unique information which are in actual fact as well as helpful for everyone. Boiler Repair Kenosha WI is one of my business, it provide one of the best AC services. Heat Pumps are very efficient as they produce much more heat energy than they use in electrical operating energy. This post is really useful for my Air Conditioning Sugar Land business. Thanks for sharing with us.This provide more useful information for us. I have one of my Boiler Repair Chicago business, i hope you like it. A year on... the two way communication version with Zigbee has been working, but I have noticed that the time of day has been off sometimes by a few minutes, sometimes by a few hours. I go in to program the time and I see the date is wrong. So I correct the time of day and the date, save it, go back in and it's still correct. The next day I come back and it's gone back to the wrong time and wrong date. I removed my old unit before they arrived. Pepco needs to verify everything is working. They allowed me hold the wires together for this test. I hope someone finds the default password, I'd love to see what information the thermostat is holding.